The central nervous system (CNS) should be especially sensitive to disturbances in trace element concentrations because of its high metabolic rate and low capacity for regeneration. 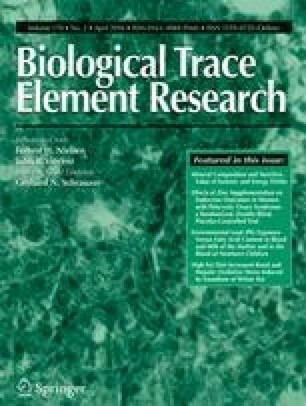 Comparatively few studies have been made on trace elements in the CNS, which prompted us to begin a study of trace elements in four different brain lobes of the CNS, as well as in the spinal cord. Samples were obtained at autopsy and handled carefully in order to avoid contamination. They were freeze-dried and sealed in quartz tubes that were irradiated in a nuclear reactor. A simple chemical separation into six fractions was performed. The gamma spectra for these fractions was registered using a Ge(Li) detector and a computerized multichannel analyzer. Results for the following elements were obtained: Ca, Cd, Co, Cr, Cs, Cu, Fe, Rb, Se, and Zn, as well as for Na and K (not reported). Other elements were also detected in some samples. Using this technique, brain samples from ten patients with Alzheimer’s disease and ten control cases were examined.